This week I’m talking about what is possibly the hardest thing for most authors – attending events and signings to try and sell their books. At a recent event, another author and myself were talking to a fellow author about this very thing, and she was saying how hard she found it to attend those kinds of events. Most authors are introverts and we’d much rather be in our own little worlds creating stories than going out into the real world to talk about them. Social media and internet interactions are frequently favoured over face-to-face marketing, simply because it’s less threatening for most. But as I said in my first blog in this series, it’s definitely something you need to do. My rankings on sites like Amazon improve after every single author event I’ve attended in person. Unfortunately, it’s something I struggle with too. The hardest part, for me, is going into a bookstore to request a signing. This was daunting before I even tried, and it hasn’t improved because, of course, I’ve received numerous knock-backs. Most bookstores, especially the big chains, aren’t interested in having local authors in. And while I’ve managed to keep going to other bookstores and have found some who are happy to have me, I must confess I’ve never had the nerve to go back to a bookstore where I’ve previously been refused and try them again. I just too confronting for me. However, I know it has worked for other people, so I encourage you to be braver than I am and give it a go. Some authors struggle less with the asking and more with the event itself, and they’re difficult too. After all, most of us try and avoid looking at those pushy sales people who want to stop us in the middle of our shopping to talk to us about a product that we don’t necessarily want. It’s hard to do that. This is why I take a basket of chocolates to every signing in a bookstore. It’s a lot easier to say, ‘Would you like a chocolate?’ first, then follow up with, ‘Can I tell you about my book?’ rather than put the second question first. It has certainly helped me get sales. It’s also good to have things to give away like key rings, small trinkets, t-shirts. Of course, these things cost money, and not everyone can afford them, so offering deals on your books can help, although most bookstores won’t go for that, so it might be an idea to save book deals for other events, outside bookstores, things like markets, school fetes and other places that might allow you to have a stall. Many of them have fees, but they’re not usually too excessive, although some events might also insist you have your own insurance, and if you’re going to do those kinds of events regularly, it’s a good thing to consider. At the event itself, try and maintain a positive attitude. Try and keep a smile and a ‘happy voice’ going. If you’ve ever worked in retail or at a place where you’re answering phones regularly, you probably know all about the ‘happy voice’. Try and sound bubbly and carefree. If you imagine yourself smiling; it can help. And if you do get a knock-back, just plaster the smile back on and try again with the next person. It’s tough, but I’ve found it does work. 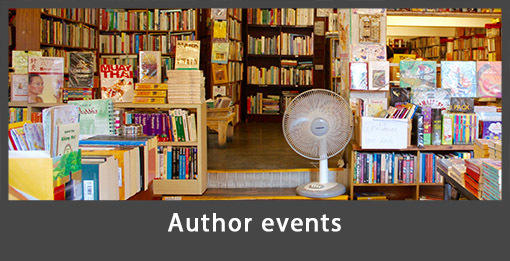 Lately, I’ve also done a few events with a group of other authors. This has been a fantastic way to do things, especially at something like a market or a fete stall, as if the person you’re talking to isn’t interested in your books, you can suggest one of the other authors’ books instead. You can also encourage each other and it gives you a chance to have a break, if you need it, as there are other people to man your stall, even if you aren’t there for a few minutes. The important thing is getting yourself out there. How else are people going to hear about your book? They aren’t going to unless someone tells them. Marketing is not an optional extra for any author these days. Even those with big publishers are expected to get out there and tell people about their books. It’s the only way you’ll ever have a chance of success. Are you a reader? Where have you encountered authors? Are you an author? Which events have you found have worked best for you? Let me know in the comments section at the bottom of the page. Glad you will be available 🙂 All the best for the October.